The building and the museum's namesake date back to the late 1800s, when Charleston local James Shoolbred Gibbes donated $100,000 towards the formation of a new art museum upon his death in 1899. Honoring Gibbes' specific wishes for a new hall or halls that would be suitable for the exhibition of paintings, the trustees, Charles H. Simonton, and the mayor of Charleston at the time, J. Adger Smith, joined forces and purchased a lot on 135 Meeting Street for just this purpose. The team then brought in famous Kentucky architect Frank P. Milburn to bring the concept of an exceptional arts hall and museum to life. Milburn was best known for his stately and striking court houses in North Carolina and Tennessee, and was in the process of completing the State House of South Carolina in Columbia when we was called on to begin this new project in 1903. Milburn's design mimicked these towering governmental institutes while paying homage to the Beaux Arts style that was popular for public buildings and museums at the time. The end result was a distinguished four columned structure with a Tiffany-style dome, Doric columns, and pediment capped windows and doors. Officially named the "James S. Gibbes Memorial Art Gallery," which is inscribed at the top of the exterior entrance, the museum officially opened to the public on April 11, 1905, and was received with warm enthusiasm from the community and national art critics alike. This grand opening included a collection to rival the beauty and prestige of the new building itself, and included collections borrowed from New York as well as local pieces from other Charleston county galleries. 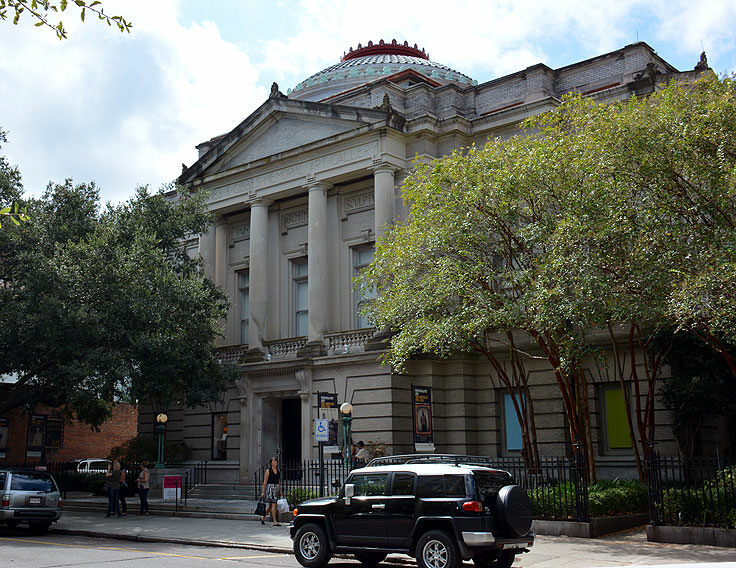 Today, the museum boasts over 10,000 works of art, which are mainly American works with some connection to the south or Charleston-specific region. The permanent collection features historic works that include beautiful landscapes of the original Mulberry Plantation, the colonial era, and accurate portraits of Charleston movers and shakers from centuries ago. Roughly divided into three groupings, specifically the Colonial period, the Charleston Renaissance period, and contemporary works, patrons will find pieces and paintings that honor or stem from just about every significant period of Charleston history. In addition, the museum has a rotating series of collections available for limited periods of time that are borrowed from famous museums from all over the world. 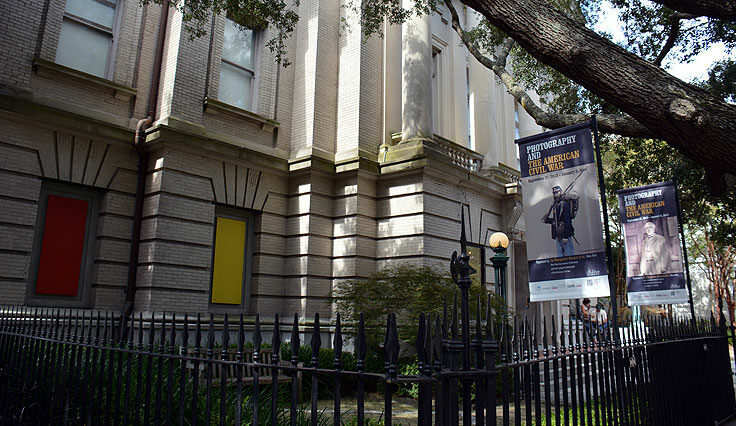 Spanning virtually every style, era and genre, frequent Charleston visitors are encouraged to return to the gallery again and again to see what new exhibitions are on display and open for the public's admiration. The museum is also very involved with community education and outreach programs, and features numerous classes, lectures and programs that encourage creativity for budding artists of all ages and skill levels. From fun classes that concentrate on a particular medium to extensive tours that dig deep into the history of the gallery's most famous paintings, (and the Gibbes Museum of Art's building itself), virtually every week brings a new wave of opportunities to settle in and learn something new. An extensive online calendar of events, located at http://www.gibbesmuseum.org/visit/calendar.php, outlines all of these upcoming programs and classes, in addition to special events including exhibition openings, special luncheons, and even fundraising galas that are open to the public. Potential visitors can also check in with the museum's Facebook page at https://www.facebook.com/pages/Gibbes-Museum-of-Art/50759700337 for more information on upcoming happenings and special insights into the gallery's prized exhibitions. School groups and field trips are also always welcome, and educators are encouraged to call the museum for more information, and to tailor an upcoming trip to correspond with a special lesson plan. For more information on educational programs and trips, planners and teachers can call the Gibbes Museum of Art at (843) 722-2706. The Gibbes Museum of Art is open from 10:00 a.m. until 5:00 p.m., Tuesday through Saturday, and 1:00 p.m. until 5:00 p.m. on Sundays. Admission generally runs around $9 for adults, $7 for seniors, students and military, and $5 for Children ages 6 - 12, with free admission for museum members as well as kids under 6. A complimentary Cell Phone Audio Tour is available with every paid admission, allowing visitors to use their own cell phone to access in-depth information about the museum collection and specific works on view. There are also a number of guided tours available that offer extensive expeditions of the museum as well as neighboring landmarks in the historic district. Costs for these tours generally range from $20-$25 and are a favorite outing for avid museum fans. For more information on specific tours available and reservations, visitors can refer to museum's website at http://www.gibbesmuseum.org/visit/visit_main.php/. The Gibbes Museum of Art is an all but required outing for any Charleston visitor who wants to enjoy one of largest southern collections of fine artworks on full display, while admiring one of the most unique and distinguished buildings in the prestigious Charleston historic district. Known inside and out as one of South Carolina's most alluring attractions, The Gibbes Museum of Art will surely make an art lover out of any everyday Charleston vacationer.